The design phase usually starts in early March. Really, you say, that early in the year? Really! Something is going on virtually year-round be it planning, networking, developing new attractions, you name it. 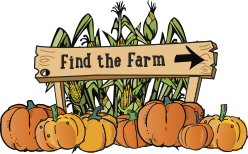 For the corn maze attraction, we work with a design company out of Utah, The Maize Company, who have been designing and creating mazes for over 13 years in the United States, Canada, and Italy. Our design can come from any number of places, depending on current events, local events, or Amanda’s mood. Eric and Amanda usually hash it out while in the car running errands or over the dinner table. The process basically involves one or the other throwing out an idea with the other having veto power. Some years are pretty easy, like when we decided to honor Fort Rucker or the Alabama farmer. Others are a little more difficult, like this year’s design. This year was actually the latest we ever decided on a design, not finalizing it until early July, and actually went through about 7 or 8 designs before deciding on a 5th anniversary celebration. Even that almost got scrapped at the last minute. Sounds pretty boring, I know, but the maze design is such an integral part of our operations, we get pretty antsy about it. It’s kind of our hallmark, our little niche. Something new every year. After we pick a concept, we confer with The Maize Company to engineer it to actually fit in the corn field. The corn gets planted in late July. In fact, by the time our corn breaks the ground, most farmers here are starting the combines. While the actual “maze cutting” process is a trade secret I will not reveal here, it is usually done in one day with the help of our Utah friends. We have them come down and assist simply because we don’t want to mess it up. You really only get one chance to maze a good maze. It does not involve UFOs, supercomputers, or space cowboys. Just Utah cowboys. From there, the maze grows around the design until we get what you see come the end of September. Most folks ask what we do with the corn at the end of the season. Well, nothing at CornDodgers Farm goes to waste. Our corn is combined, usually in late December, and used for animal feed. So that’s (mostly) how we do it. We are very excited to be starting our 5th season here in the Wiregrass and hope for many more. See you real soon! Next post: What?? Where?? When?? Previous post: It can be done!